I don’t discriminate against types of food. I eat pork, chicken, fish and beef. Life is too short, I want to enjoy it all. When I married my husband, I renewed my love of steak and I think I renewed his love of potatoes (what is more perfect than a potatoe?!). 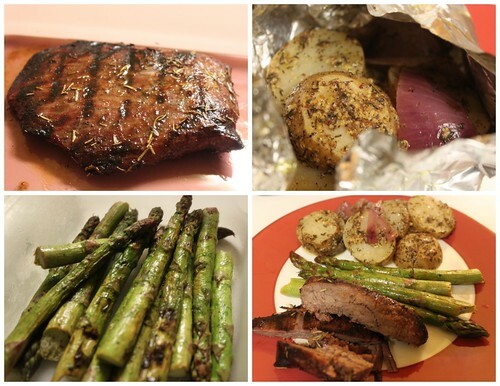 This is one of my favorite meals to grill and everything is so simple and flavorful. The Steak: I marinated a piece of flank steak in soy sauce, olive oil, honey, garlic, rosemary, salt and pepper. 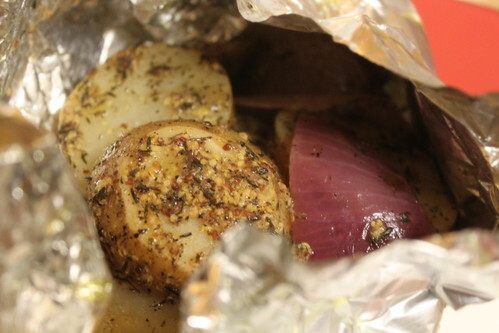 The Potato Packets: I cook potatoes and onions on the grill in aluminum foil packages with this recipe from Epicurious.com. Even if you burn them, the potatoes still taste AH-MAZING. The Asparagus: Asparagus really doesn’t need a lot when you grill it. A drizzle of olive oil, a squeeze of lemon juice and then salt and pepper. Grill them until they’re tender. These 3 easy pieces make one of the best grilled dinners I’ve had all summer. What’s your grill specialty?